My best friend Bum Tenorio once asked me, What is your best travel experience? Without batting an eyelash, I quipped, “The next one,” simply because I am always looking forward to my next adventure with great anticipation, believing that our best days are not behind us but in front of us. For believers, vortexes are spiraling centers of cosmic energy that lead to heightened self-awareness and spiritual improvement. In Sedona, these funnels of the Earth’s inner energy are prime spots for meditation. When I am here, I just feel connected, integrated to all that matters most. You can certainly be enthralled by God’s ethereal divinations, the creator of such unfathomable grandiosity. My home away from home here in Sedona is the quaint and cozy Sedona Cathedral Hideaway Bed & Breakfast, owned and lovingly operated by gracious couple Kathy and Larry Jaeckel. This new 4,600-square-foot eco-luxury B&B rests on a hill with 360-degree views of red rock by day and trillions of stars by telescope or the naked eye at night. A serene, pastoral, uplifting, panoramic red rock setting like nothing you have ever seen before. In fact, thousands of hummingbirds have made this sanctuary their home. Kathy and Larry are eagerly anticipating their participation in the Hummingbird Festival in Sedona in August 2012. 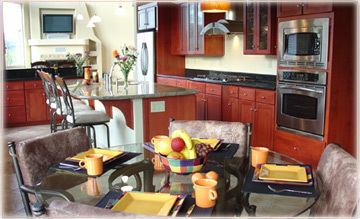 The luxurious haven is also the couple’s home and they have two large suites that they lease. Since then, approximately 500 couples/families have been returning guests immensely satisfied with the loving hospitality that is their way of life. They whip up the most delectable breakfast of smoothies, muesli granola cups, homemade oatmeal, freshly baked muffins, pancakes, waffles, eggs benedict, egg pizza, fluffy omelettes, cinnamon French toast with maple syrup, delectable homemade ice cream and chocolate — anything to your heart’s content served on their porch overlooking the amazing Cathedral Rock, the most popular of all red rock formations. Snuggle up with a book by your private fireplace or on one of the many decks. 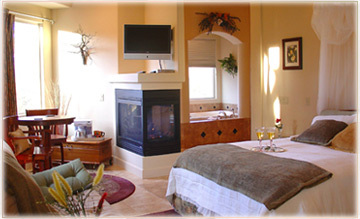 Relax and regroup in the two-person whirlpool tub or generous double shower room. This is a kind of ambiance that is inspirational and fosters clarity and vitality. You feel as though you have been transported to another planet. The surreal ambience is simply divine. I was teasing the gracious couple that their safari suite seemed like a bedroom from a James Bond flick, what with its fully automated Sleep Comfort beds, peninsula fireplaces, whirlpool bath, DVD players, microwaves, refrigerators, curtains, lights, piped-in music, central air conditioning, heated towel racks, spa bathtub replete with all amenities. Everything can be controlled by a mere touch of the remote control system. At the Evergreen room, the earth-toned curtains also electronically reveals the breathtaking buttress of the Cathedral Rock and other alluring rock formations, you are enticed to climb it like a victorious conquest. Bright and chirpy, you awaken to the symphony of birdsong: so pleasant to the soul to hear as the sun is beginning to set. As we hike up Cathedral Rock with our hiking teacher John Meyers, the expert guide and information officer, we realize that we are trekking over the past—the durable remains of what has existed before on this prime beach property. At that time, we would have been walking along the beach of warm ocean waves. Strong winds blowing against the gigantic reddish-orange coastal dunes would have been flying like cosmic dust. The short but steep hike to the “saddle” of Cathedral Rock can be tough, but the rewarding views of the multi–spired formation are incredible. The hike up to Cathedral Rock reawakens your soul. As you witness the wild foliage, rock formations, icy rain soaking the sandstone, you begin to imbibe in your own inner landscape — the synergy of such mystery and awesome beauty. Forgotten dreams, creative inspirations are awakened in this land of timeless space. From whatever angle you choose to view, the Red Rocks cast a powerful spell that one simply cannot ignore. As Sedona has mushroomed from a small town into a mecca, the people have done much to protect their rustic look with reverence and revelry. Even the global food chain McDonald’s had to conform to the city’s strict ordinances, changing the iconic golden arches to teal at its West Sedona location. And when the sun sets, there are also ordinances for “light pollution” to protect the night sky for those wanting to do stargazing. 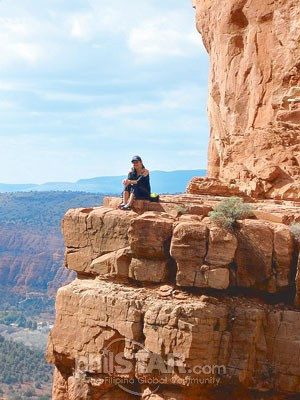 From Cathedral Rock, this is one activity you will love to do. On a moonless night, just sit by the porch with a cup of hot cocoa with buttermilk and gingersnap cookies or fine wine with hors d’oeuvres and find the different constellations that illumine the romantic sky. If you are lucky, a shooting star may even come your way and you can wish to your heart’s desire. There was a heavy downpour late that evening and Kathy, an aesthetician by profession, lovingly offered to do a reflexology hand treatment with paraffin wax. In-house guests can be treated to her fabulous beauty treatments. When the rain stopped the next morning, we went on a Vortex Tour with HeartWalk’s gracious owners Leon Pelletier and Phoenix Rising Star. At HeartWalk Healing and Training center, they offer a variety of services such as Integrated Energy Therapy Healing Sessions, Angel Readings, Vortex Tours, and Medicine Wheel Ceremonies, Hiking Adventures and Aura Photo Readings and others. It was interesting to compare how different the aura readings were before and after the Vortex walk. It is a joy to know this gracious couple — they assist you in your search for inner peace and bliss by teaching you how to embrace love, gratitude and compassion. We embarked on a vortex walk around the Buddhist stupa and learned so much more about energy fields. More adventurous travelers may want to stay longer to explore the natural attractions and historic sites around the Verde Valley. The nearby Slide Rock State Park and the small mining town of Jerome (reputed to be haunted) and the Native American ruins that dot the terrain are worth exploring as well. I will never forget waking up each morning, observing the morning mist rise above the red rock buttresses, like a moving natural diorama of pristine landscape revealing powder-blue skies with eagles hovering gracefully as if announcing the beginning of a new day. It is divine landscapes like these that are simply worth traveling the distance for. We truly feel God’s omnipotent hand in such sublime divinity. Just listen to your heart beat as you view the scene and your breath like an angel whispering felicitations of gratitude for such an abundance. Falling in love with Sedona is like catching up with a childhood crush. You remember how wonderful it feels to be reunited even after all these years. You wish you could stay much longer. I have decided to. After all, leaving a unique paradise of such sublime beauty and bliss is a difficult task. Traveling isn’t just about changing destinations; it’s about changing perspectives. Let us continue traveling, exploring and take that journey to the center of ourselves and around us. Our next trip may just be more exhilarating than the last.